Gardenia Country Inn is a restaurant and resort with natural concept in Tomohon City, North Sulawesi. The Gardenia Restaurant is in the middle of a pretty garden full of flowers. Not only that, the most amazing view is the existence of Mount Lokon which stands majestically in the south of Tomohon City. This mountain can be seen clearly, although the weather when we visited was rather cloudy. The Gardenia Country Inn is also a resort that offers a place to escape the hustle and bustle of the city. Visitors can stay in bungalows and rooms that are made entirely of wood. Visitors can eat organic food from their own garden. The air in Gardenia Country Inn is cool, even at night can reach 18 degrees celsius. A wide variety of plants, including flowering plants, spices, and vegetables add to the ambiance of this resort. 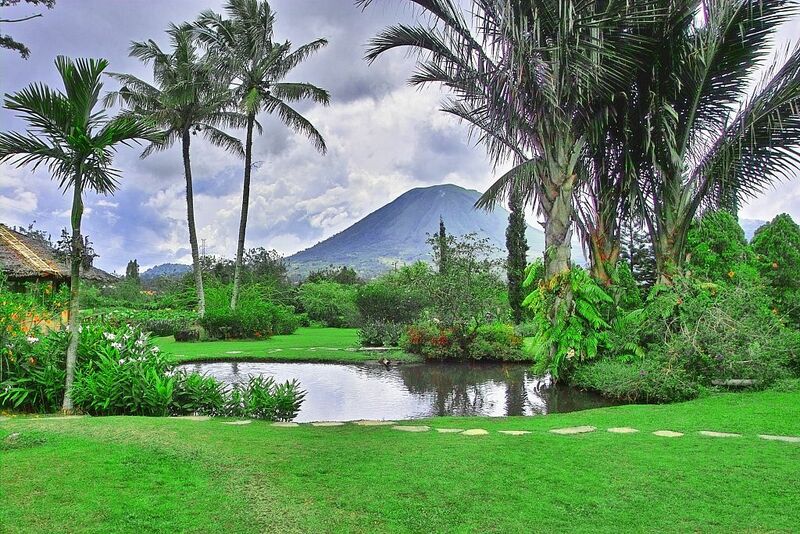 Tomohon is known as the city of beautiful and green flowers. Each year, this city holds "Tomohon International Flower Festival" which is visited by tourists from home and abroad. Foreign tourists who come to the city of Tomohon in 2016 reached 26,261 and domestic tourists reached 244,563 people. The park in Gardenia Country Inn is not only planted with flowers and ornamental plants, but also food crops. There are cabbages, tomatoes, cucumbers, carrots and fruits. Seasoning plants are also grown around this park, such as lemongrass, ginger and saffron whose results are also harvested for cooking spices in the restaurant. Interested in visiting Gardenia Country Inn? This place is in Tomohon City, about 90 minutes drive from the capital of North Sulawesi, Manado.